Duration: 1 hr. 12 min. From the very first episode in Season 1, Date A Live was definitely unique in its set-up. Using dates to save spirits from their misery is certainly a concept that you do not see often in the romance genre (except maybe The World God Only Knows? Just maybe?) and this was initially executed in a very interesting way. Where Date A Live goes wrong, however, is that, instead of coming up with something new, the writers choose to recycle the same generic formula once, twice, and now thrice. “Formula? What the heck are you talking about? What formula is this?” you may ask. Nothing wrong with asking a totally legitimate question. And to answer: well, let us boil down exactly what happened in the past two seasons. Whenever a problem comes up in the form of a new character, tensions among various characters, or some kind of event, how do the characters resolve it? That’s right, a date. Something as simple as two people spending time together as a way to seal up the worst of the worst. Does this happen once again in Mayuri Judgment? Certainly. But having Shidou go on six dates for the first 45 minutes of the movie was really unnecessary and dragged the plot on and on. Nothing spectacular come out of these dates, and we learned nothing new about the characters that we did not already know. As for the climax itself, talk about messy, messy, messy. One thing that I kept asking was what the heck is the big-ball-of-doom doing there? The relationship between that and Mayuri’s presence is constantly hinted at during the “climax” battle, but it’s never fully explained and thus we end up taking it at face value. Moving onto the characters themselves, there really isn’t any development at all. In the first and second seasons, dates were used as a way to forge and deepen the relationships between Shidou and the rest of the main characters. Since they are all now close friends, these dates don’t hold the same kind of meaning anymore, hence the little character development. Don’t get me wrong – the characters are definitely interesting – it’s just that they don’t really change at all. One new character does come into the mix: Mayuri. But she’s just there with really no purpose for most of the movie – stalking around in the background, following the main characters around, with some hints here and there. When it’s finally her time to shine, she transitions into the plot inconsistently and poorly. In one moment, nobody but Shidou can see her, but all of a sudden in the next second everybody else can. All of this crammed into literally the last 20 to 30 minutes of the movie. The only one character I was extremely disappointed with was Origami. She was completely a throwaway character in the movie who butts in randomly to challenge Tohka (as if we’ve never seen this happen in the previous seasons), and then removes herself from the picture once that is over. The movie could have just done well without her (although I’m sure the fans wouldn’t have liked that). Sound and art are of high quality. The animation is by Production IMS so it is definitely high quality. The voice acting is also done well. I personally really like how Shidou changes his voice when he switches into his female counterpart. My only major issue is that sometimes the 3D graphics looked a little odd and incompatible with the bright, well-illuminated background, but otherwise from that, no complaints on that front. So is this movie worth your time? Well if you’re reading this review and thinking about it, you’ve probably already enjoyed the first two seasons well enough so go right ahead. From a critical standpoint, however, I was pretty disappointed. Date A Live: Mayuri Judgment did not put itself ahead of the pack. Author's Disclaimer: Please remember, this is my own personal opinion. I critique anime primarily on how the story is executed and how well-rounded the characters are. This review is not meant to target any other review but was intended to provide a more holistic analysis. I was really hyped for this movie, being a date a live fan, but this movie gave me the impression: " thats it?" It wasnt really much, just shido going on dates again and the appearance of mayuri. She literally talked for only about 5 minutes before she basicallly dissapears.Before she appeared at the ending you can only get glimpses of her. IMO i was dissapointed in this movie. Action was really good though. Very good soundtrack, loved how they used season 1 opening song again, was fantastic during the action scenes. Was overall a great movie as a harem fan, but story was pretty down the drain. Still a must watch for date a live fans! In my opinion, Date A Live is the BEST ANIME for me! I just finished watch this on 1/12/2015! Soundtrack 10/10,Story 10/10,Character 10/10 ! I love Date A Live so much! Hoping for more season! I love how the narrator narrates in the beginning of every episode! 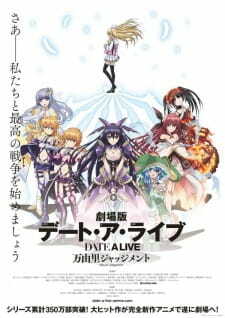 As for the soundtrack by sweet arms I Freakin Love Your Song in all Date A Live series,never gets bored! The character's design were outstanding maybe because I was so obsessed with it but for me it's perfect,the expression,design,colour and everything! In this movie, of course everybody knows a new spirit is introduced as shown in the trailer ....I am not gonna say her name to prevent spoiler....but I gotta say she has the best spirit form outfit design I ever seen. The colour and her angel WOW! Blown mind XD. Thank you for making Date A Live! When I first heard a movie was being produced for Date a Live, I wasn't excited in the slightest. But they out did themselves this time. If we watched Date a Live before, the story isn't amazing by any means but it is very enjoyable. Same goes for the movie, if you enjoyed the anime seasons, you will enjoy the movie just as much, if not more. It still doesn't look as polished as season 1's blu-ray edition, but it comes pretty damn close. You can tell they put a lot of effort in improving the art style from the horrendous looking season 2. However, I'm docking some points because during the last part of the movie the art suddenly shifted back into season 2 standards, and the action scene isn't very well animated or structured. The movie reuses a few tracks from both seasons and a couple of new ones. All of them sound amazing in the movie and fit the scenes quite nicely, the voice actors do a fantastic job voicing the characters, Mayuri's voice actor also does a great job at voicing her. For once in the anime, we get a huge emphasis on the girls. Usually this is reserved for the visual novel games and the Ova, but finally we get moments with Shidou and the girls going on dates. Hence Date A Live. For those of us who got burned after watching season 2's horrible pacing and animation, this movie will heal that wound and reignite the flames that season 1 had started. Everyone I was watching with laughed at the hilarious scenes shown in the movie, and the dates themselves got us a few laughs too. If you love Date a Live, this is a must watch. The movie recaptures what season 2 lost and tries desperately to be as good as season 1, and it succeeded in many regards. Is this required before season 3?